NB: This post will be the first in an occasional series called "A stroll through Walter Benjamin's Berlin." Berlin Childhood around 1900 pivots on the threshold between the nineteenth and the twentieth centuries, memorializing a world that was about to disappear, not without marking its complicity with the unending brutality of the "victor," while glancing simultaneously backward to the heyday of the bourgeoisie and forward to the global crisis. In 1932, when I was abroad, it began to be clear to me that I would soon have to bid a long, perhaps lasting farewell to the city of my birth. Several times in my inner life, I had already experienced the process of inoculation as something salutary. In this situation, too, I resolved to follow suit, and I deliberately called to mind those images, which, in exile, are most apt to waken homesickness: images of childhood. My assumption was that the feeling of longing would no more gain mastery over my spirit than a vaccine does over a healthy body. I sought to limit its effect through insight into the irretrievability--not the contingent biographical but the necessary social irretrievability--of the past. 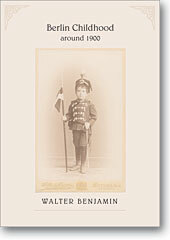 From the beginning we can see that Berlin Childhood is going to be a very personal work for Benjamin--it arises not out of some abstract idea, but rather a personal need--the need to protect or "inoculate" himself against the awful homesickness of the exile. In an effort to ward off this disease, Benjamin has decided to play spiritual doctor to himself, administering the "vaccine" of memory so that he might be steeled against such longings in the rough days ahead (at this point, however, not even Benjamin could have known just how tough he would need to be). But the last sentence makes clear that it's not all about Benjamin; it's about a time, a place, a whole set of relationships between people that is gone and that can never be "retrieved." This has meant that certain biographical features, which stand out more readily in the continuity of experience than in its depths, altogether recede in the present undertaking. And with them go the physiognomies--those of my family and comrades alike. On the other hand, I have made an effort to get hold of the images in which the experience of the big city is precipitated in a child of the middle class. How does the city imprint itself on the mind of a child from that time and place? Benjamin believes that it is through the images it presents--its physical form. It is only through these images that a vanished Berlin can be conjured up once again, and it is with these images that Benjamin will seek to "inoculate" himself. This focus on images has implications for the structure of Berlin Childhood, laid out as it is in a series of vignettes that taken together serve to "reconstruct" what living in Berlin must have been like for a middle-class Jewish boy around the turn of the century. I believe it possible that a fate expressly theirs is held in reserve for such images. No customary forms await them yet, like those that, over the course of centuries, and in obedience to a feeling for nature, answer to remembrances of a childhood set in the country. But, then, the images of my metropolitan childhood perhaps are capable, at their core, of preforming later historical experience. I hope they will at least suggest how thoroughly the person spoken of here would later dispense with the security allotted his childhood. What other writers have done for the country, Benjamin seeks to do for the city. As an adult, frequently on the run from the Nazis, Benjamin looks back at what must have seemed an impossibly idyllic time and place. In the pages that follow, he will preserve the images of that lost era, in the process constructing one of the greatest and most complex documents of city life ever produced. Over the coming weeks we'll accompany Benjamin on his travels through the lost Berlin of his youth. As the quintessential flaneur of his generation, we're sure he would approve.